While you love your cat, if you’re being honest, there are times when they can act in ways that are a little upsetting. This is especially true if they decide to dig their razor-sharp claws into that expensive couch you just bought! But no matter how much your cat claws at your furniture, declawing cats — a procedure also known as an onychectomy — is never acceptable. Not only is it incredibly painful for your cat, but it can also lead to severe physical and even emotional complications. These are just a few of the reasons you should never declaw a cat, as well as some humane alternatives to declawing. When someone makes the unfortunate decision to declaw a cat, they are often under the mistaken belief that the process is similar to heading to the spa for a manicure. Declawing a cat is serious business. It’s very similar to amputation of a human’s finger at the last knuckle. If that’s not enough to convince you that declawing your cat is wrong, let’s take a look at just some of the potential complications that can arise from this inhumane form of surgery. No matter how skilled your veterinarian may be, or how well the surgery may go, there’s also always a risk of infection. When an infection occurs during an unnecessary surgery like declawing, that makes the situation even worse. A vet may recommend a regimen of antibiotics, but let’s face it – this is a surgery involving a cat’s foot. Even a bandaged foot could still become infected after contacting a floor or a litter box. An infection can get into a nearby bone and then travel throughout the rest of the body. Infections can result in the need for even more extensive surgeries. Instead of resorting to an inhumane process such as declawing, cat owners can instead try one of the many other options available. 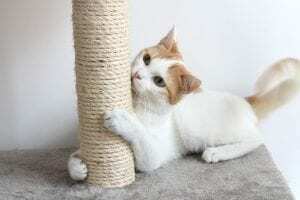 For example, instead of declawing cats, many owners will provide scratching posts so their pets can express their natural behavior without tearing up the couch in the process. These posts come in a variety of different models, and many of them even provide space so a cat can chill out afterward. They’re also available in a variety of materials, including carpet and rope. Now, you want to look for scratchers that are stable enough they won’t fall over while your cat is getting a good scratch workout. If you’re in a pinch, though, a cardboard box might also work. Don’t be surprised, though, if you need to try two or three different scratchers before you find one your cat likes. 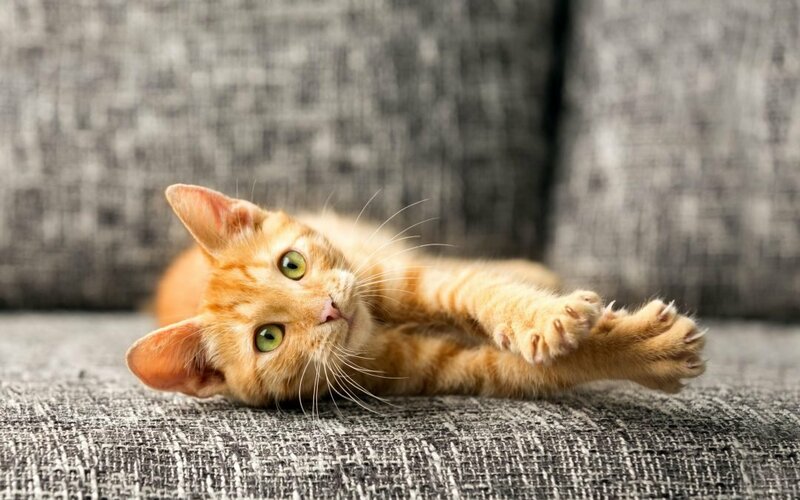 Another alternative to declawing cats is to keep their nails at a manageable length. You can easily clip nails at home, but if you have any problems, you can always take your pet to a groomer or a vet. If you’d rather leave it to a professional to trim cat nails, make sure you do so on a regular basis. You can also try using temporary nail caps for your indoor cat to protect your furniture. These caps slide over the cat’s nails and protect your property as well as your skin. They’ll usually need to be replaced after around 4-6 weeks. An onychectomy can lead to a lot of serious consequences, so hopefully, you won’t consider this inhumane practice for your pet. If your cat’s scratching of your furniture and other property is driving you crazy, there are a lot of safe alternatives for you to consider. Why Is My Cat Staring At Me?